For today’s bulletin, we take a look at shoe, apparel, and lifestyle fitness company, Adidas (ADDYY). The stock was upgraded to BUY today. VALUATION WARNING: Overvalued stocks now make up 67.27% of our stocks assigned a valuation and 29.77% of those equities are calculated to be overvalued by 20% or more. Sixteen sectors are calculated to be overvalued. When one thinks of big fitness companies in the US, one commonly mentions Nike and Under Armour. But there is another giant on the scene with world wide reach, German giant Adidas. The brand has been around for a long time with its iconic three stripes, and has been coming on very strong lately. 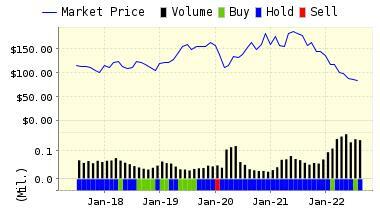 We upgraded the stock to BUY today, and if you take a look at the chart below, you will find that that shares have jumped hard over the past few months. This comes on top of a big gain in 2016 as well. The company has always had cache among soccer players, urban populations, musical groups, and other so-called “influencers,” but they have also pushed into other market segments with a re-emphasis on vintage brands. 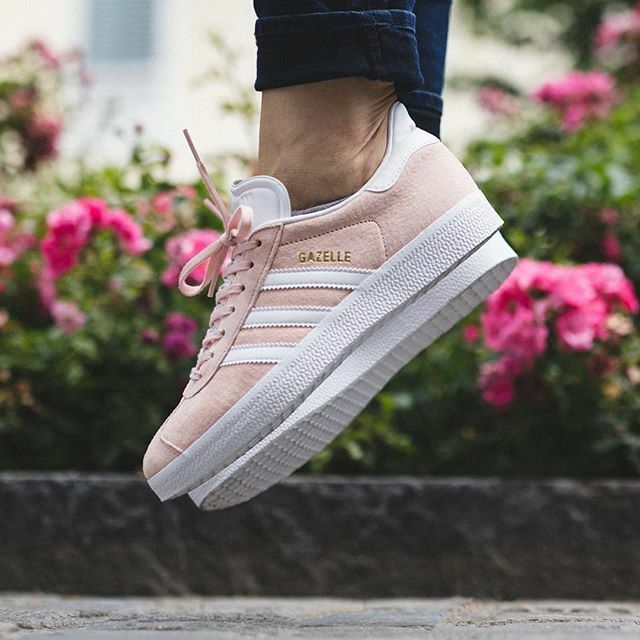 Popular styles from days gone by like the iconic Gazelle, Stan Smith tennis shoes, and the Superstar, have found favor with the millennial generation. The shoes never really lost their popularity with the hip-hop community–which dates back to the birth of that musical genre. The company has also re-emphasized sports, with forays into basketball, golf, hockey, and running. This is important because putting all of your eggs into the fashion game can be fickle, with profits degraded once consumers move on to other trends. Adidas, however, maintains credibility among the shoe cognoscenti. Can one remember the last time a big pop star, model, or other artists made a song or any sort of cultural statement about Nike or Under Armour? Key to Rorsted’s new plans are continued and improved growth with the US. As the second-fiddle to Nike worldwide, the company must boost profitability to match their chief competitor. That also means a focus on the US, because this is where Nike is most dominant. It will also involve cutting back on sectors where the company has not been so profitable–like the prior-mentioned golf and hockey businesses. And, Rorsted must take whatever steps are necessary to protect the fashion/style/lifestyle business to the greatest extent possible. Adidas is a leading brand in the sporting goods market with strong positions in footwear, apparel and hardware. Adidas products offer technological innovations and cutting-edge designs to athletes of all skill levels who aspire to achieve peak performance. The Adidas brand is structured in three divisions: Forever Sport, Originals and Adidas Equipment. VALUENGINE RECOMMENDATION: ValuEngine updated its recommendation from HOLD to BUY for Adidas ADR on 2017-03-07. Based on the information we have gathered and our resulting research, we feel that Adidas ADR has the probability to OUTPERFORM average market performance for the next year. The company exhibits ATTRACTIVE Company Size and Momentum. You can download a free copy of detailed report on Adidas (ADDYY) from the link below.